Dermatologists are reporting a surge in the number of raver patients with scabies and conclusions have been drawn that dirty upholstered seating furniture found at underground parties is likely the culprit. After a recent survey conducted by rave statisticians was taken amongst ravers diagnosed with scabies, nearly all reported individuals having spent time sitting on seating provided at many abandoned loft parties near the Griffentown area. Though none of the cases have proven to be severe, the likelihood of continued spread is very possible. "Scabies is very difficult to treat 100%," says Dermatologist Dr . Patel. 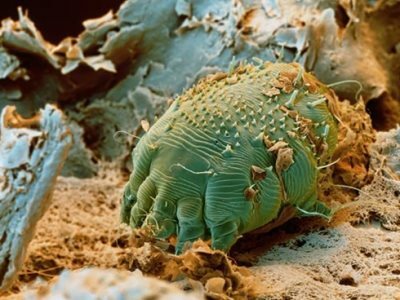 "The problem is that even if we remove the scabies from the host, scabies can live up to 2 or three 3 days without a human host and can even remain dormant, embedded in upholstered furniture or even clothes and curtains, waiting for an opportune moment." Dr. Patel goes on to explain that the risks are very likely large when attending underground events. "The furniture has probably been used for years and with the array of people that find themselves at these events, it's no surprise people bring their scabies to and from these unregulated events," he says, pausing to reconsider his thoughts. "It's not that these parties shouldn't be happening, I just think more effort should be made to respect certain fundamentals of hygiene and clean public seating is step one in stopping the spread of scabies." Whether ravers will be seeing bugs for real this time is hard to say. The fact that scabies are nearly impossible to see paired with the impressionable mind of party goers who experiment with psychedelics, the possibility of panic spreading about scabies is something to consider.